OXFORD, Miss. – The University of Mississippi saxophone studio traveled to the University of Georgia last month for a joint event that included a teacher swap, master class and collaborative concert. 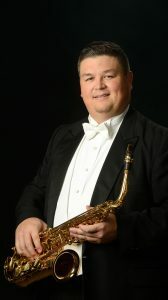 Adam Estes, UM assistant professor of music, traveled with seven of his students to Athens, Georgia, where they worked alongside Connie Frigo, associate professor of saxophone at Georgia, and her students. The event was funded by a travel grant from the Southeastern Conference as part of its academic initiative. Estes and Frigo, who met while in graduate school at the University of South Carolina, proposed the idea last spring to gather students from both institutions for a joint event. Generally, SEC travel grants are used for faculty support. Estes has previously used the program to travel with a pianist to various SEC schools and provide master classes to students there. The board liked the idea that Estes and Frigo’s proposal was not only faculty-centric, but focused on student as well, Estes said. The grant had funded student travel expenses for the collaboration, which was structured differently from other events. The event included Estes and Frigo teaching saxophone fundamentals and helping students improve their sight-reading skills. Students then engaged in peer-to-peer coaching under the supervision of both instructors. In addition, both instructors conducted a formal faculty master class, working with selected students from each studio in front of the entire class. “Learning how to break the ice with people from other places is an invaluable tool and will serve me well in my future as I network with peers, colleagues and pedagogues from other universities,” said Ryne Anderson, a UM sophomore from Purvis who is majoring in history and music. Estes and Frigo agreed that the event has potential to grow. They are both open to expanding it in the future and inviting other SEC universities to participate. “As always, the feasibility of these events relies almost exclusively upon funding, and we are grateful for the funding that is supporting us to create a special event like this that brings together our two studios,” Frigo said.